Venus’ return to the Aries Point after her baptism in the last degree of Pisces enables us to take the love principle to the next level as omega and alpha point of the zodiac have been repeatedly transited for the elevation of the circle into a spiral with the start of a new lunation cycle that is infused with these Venusian energies. Purified and filled with sheer potentiality the desire nature feels emboldened to initiate a new beginning as our love of life surges forth under the elemental force of fire, which burns steadier and with more persistence now. 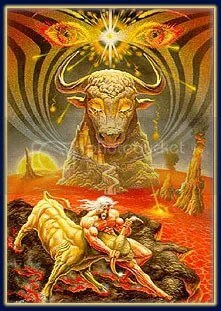 Desires born from this forging at the Taurus New Moon need to be sustained as well as fertilized. Preceding the lunation, Mercury’s sextile to Uranus in Pisces provides the impetus for momentum, accelerating the mental process toward proliferation of ideas in a web of interconnective links, which includes our social associations in order to bring us all together, dedicated toward this future trend and thereby streamlining our agendas to make progress feasible. Mercury in Taurus follows up with a square to the approaching Chiron-Neptune conjunction in Aquarius to which the semi-square between Vesta in Gemini and Eris in Aries adds pressure to carry through those common interests in a unified vision of blended individual wills. In order to advance our cause we have to move out of our comfort zone, let go of attachments and fears and break free from counter-productive and rigid mental patterns. Putting our individual differences aside facilitates collaboration and evokes the team spirit. Thus, mindfulness and commitment to the demands of the times assists us in connecting with other minds to build the bridge across a deep gorge, as implicated in the symbolical message. Stepping onto Chiron’s rainbow bridge, we’re closing the gap between heart and mind, from which wholistic understanding and empathy will ensue. Therefore, during the process of consciously individualizing and Self-unfolding we also have to remain aware of the necessity for cooperation and let us be guided by higher ideals, before we’ll be instigating the intended changes in order to ensure a fair proceeding as well as the hoped for outcome. Mars’ square to a retrograde Pluto could challenge us into battling our inner demons in case we want to push ahead too strongly or try to impose our will onto others. Going it alone could lead to alienation and be met with resistance. Pallas’ tense octile aspects to the Chiron-Neptune conjunction over the next couple of days hint at a difficult maneuvering around a highly sensitive subject. If we don’t tread very carefully and instead insist on doing things a certain way, the situation could take a turn against us and as a consequence render attempts toward self-reliancy futile, resolving nothing in the end. But acknowledging our interdependence under these conditions could help us to use circumspection and foresight during negotiations as well as ready us to make adjustments when necessary. The Sun in Taurus’ sextile to Juno in Pisces and semi-square to Uranus in Pisces at the end of April bring an opportunity for us to reflect on our principle of relating and the kind of relationships we long for, which could trigger personal insights and inspire untypical behaviour on our part. Mercury’s Gemini ingress allows for mental ease and dexterity, shifting the energy toward more flexibility and adaptability in all matters of the mind as a prelude to the First Quarter Moon when a waxing Leo Moon is at cross purpose with the Sun in Taurus. This ‘crisis in action’ could be the result of self-centered feelings seeking to gratify the ego needs and to indulge in personal drama at a time that calls for gentleness in order to guarantee steadiness and continuance in our affairs. May 1st is also a cross-quarter day, the festival of Beltane, which celebrates the flowering of life in fertility rites at the height of spring. Therefore, our motivation should be along the same lines of fruitfulness and cultivation, especially so in the event of the third Venus-Pluto square succeeding this critical phase in the lunation cycle. To rein in overly tempted passions, a relaxed, laid-back attitude would be the right approach to take. Moreover, a suave and sophisticated demeanor could ultimately prove profitable as this would strengthen our influence considerably. A lesser symmetrical triangle configuration will be formed between the Sun in Taurus, Pallas in Cancer and Saturn Rx in Virgo, which promises effortless navigating under firm cruise control. Mars in Aries will keep the stress level and the adrenaline high though with his tense octile aspects to the closer drawing Jupiter-Chiron-Neptune triple conjunction in Aquarius, provoking impulsiveness that could change things abruptly for better or worse, depending upon our awareness of the circumstances and implications this will entail. On May 7 will Mercury turn retrograde and thus for the next 3 weeks we’ll have a chance to review, rethink and reconsider the events that transpired from April 23rd onward. Already on the next day, May 8, could two octile aspects induce revising of our strategy in terms of personal resourcefulness as we’re heading into the Scorpio Full Moon. On the day of the Libra Full Moon will Mercury and Vesta engage in a semi-sextile before each of them will change signs. Mercury will travel through the territory Vesta has covered from July 2008 onward (she slipped back into Aries during her retrograde period in December 08), whereas the latter will ingress Gemini, Mercury’s sign of rulership. Since then (July 2008) we have been building up our commitment to a cause that will from now on be complemented by a tangible agenda with the culmination of this lunation cycle. As the energy shifts to infuse the Mercury-Gemini connection our dedication will be toward implementing our plan with our focus on mentally crafting. At the same time will the theme of duality, of living two separate lives, that sounded forth with the seed impulse of the Aries New Moon (on March 26), receive its full meaning. The Libra Full Moon like every other opposition calls for integration of the two poles. Both symbolical statements refer to the spiritual element, embodied by the archetype of Vesta, who had perfected a square to Chiron, the astrological symbol of man’s dual nature, at the start of this lunation cycle. Suggested is that we’ve been caught in a pattern of wounding that has been preventing us from Self-fulfilment (Venus Rx in Aries conjunct the New Moon) until we reached a point, where our dissatisfaction stirred up our spirit, prompting us to protest against this. However, we have our existence in a collective network and therefore we have to conform to the regulations of societal living, which might have required from us to keep up the appearance, while concentrating on our Self-interests. In synch with the waxing of the Moon and the overlapping of cycles (Aries New Moon, inferior conjunction of Venus and the Sun in Aries, Mercury-Venus conjunction in Aries, superior conjunction of Mercury and the Sun in Aries) did our Self-love unfold until we met “the crisis in action” at the First Quarter Phase, when we were challenged to protect our Self-interests as we approached the crossing in the road, marked by the Venus-Pluto square, which could have triggered our deepest emotional complexes. An inner struggle might have ensued that could have forced us to conquer this strong emotionality by practicing compassion in the lead-up to the Libra Full Moon when the emphasis is on reconciliation and balance. Thus, nourishing the spiritual inside us will assist us in devoting us toward our obligations in a “sacred” way that is based on harmonizing and demands ritualization of gestures as expressed in the symbols message. Eris’ conjunction to the Sun in Aries (and opposition to the Moon in Libra) at this highpoint in the cycle puts the Self at the center of this conflict, reiterating the hallmark of the latest Lunar Eclipse (from February 9) and the confrontation of selfishness and selflessness in the sense of being Full versus being Empty, that plays out as a test of character intended to cure the split between body and mind, exposited in the dual nature of man (Chiron was conjunct the Lunar Eclipse and Eris in sextile aspect). Mercury, Venus Rx and Ceres Rx are entangled in an asymmetrical triangle configuration on April 9 with Ceres Rx as the focal point that draws in Vesta the next day, while Mercury hastens away from it to join two other lesser triangular configurations, one between Pallas, Juno and Pluto Rx and another one involving the Sun, Eris, Mars and Jupiter. Apparently, we’ve completed another stage of inner growth from which we emerged with a new mindset, instructed by an evolving emotional nature that responds from a soul level, establishing a link between heart and mind. Thus, a genuinely caring attitude can warm us up from within, which can influence our decisions in a highly sensitive way, supporting inclinations toward empathy and forgiveness. As our perspective changes, our imagination is stimulated and we open us to new possibilities, thereby reaching beyond personal limitations, which could gain us peace of mind and ultimately lead to success. Venus will retrograde back into Pisces and Ceres resume direct motion to allow us to envision and embrace universal values before we can complete our emotional rebirth. Mercury’s semi-squares to the approaching Mars-Uranus conjunction in Pisces trigger mental breakthroughs, inspired by the principle of inclusiveness. A future trend could become palpable and then acted upon. Consequently, we might have to think on our feet, react quickly, update and upgrade. The Sun’s sextile to the Chiron-Neptune conjunction in Aquarius brings an opportunity for rapid progress, if we surrender to the flow of things and contribute to the momentum. Preceding the Third Quarter Moon and Venus’ change of direction, Mercury will cast a semi-square to Venus Rx in Pisces to assure that we’ll be using the adequate approach at this critical point when we could get easily overwhelmed by our desires. With the waning Capricorn Moon squaring off the Aries Sun, succeeded by the Moon’s ingress into Aquarius, Vesta in Gemini’s quincunx to Pluto Rx in Capricorn and Mercury in Taurus’ trine to Saturn Rx in Virgo, the challenge is to competently handle this situation, to be well prepared and in control in order to demonstrate our authority. On April 19th will Mercury cast a sesqui-quadrate to Pluto Rx in addition to the Sun’s ingress into Taurus. For the consolidation of our influence we will have to make matters concrete, utilizing our ideas as a platform for the sustainment of our self-worth. We’ll be entering a phase where we can build up our self-esteem and gratify our security needs. As the Sun in Taurus moves on to form a sesqui-quadrate with Saturn Rx and a trine with Ceres in Virgo, self-improvement could have been achieved and personal productivity serve for the creation of self-reliant circumstances as well as satisfying conditions. Venus will conjunct Mars in Pisces before the latter will ingress his sign of rulership, thereby transiting over the Aries Point. Cosmic feelings of unity, unconditional love and oversensitivity are highly concentrated on the emotive-intuitive level due to Venus’ prolonged hovering in this omega degree of the zodiac, coloring our intentions accordingly. Thus, Mars’ primal, instinctual energy has been modified by those transmutating energies to render it less aggressive for this new cycle that’s now beginning, which is analogous to tuning the pitch higher. Our refined mode of self-assertion will affect our manner of interrelating and that’s how “the personal becomes political”. Mercury’s square to Jupiter, semi-square to Pallas and the Sun’s trine to Pluto Rx together with Mars’ quincunx to Ceres over these couple of days stress this attitude alteration by urging us to take the leap in consciousness and at the same token offering us a different tactic to form interconnections as a result of our personal evolution. Those are the conditions under which Venus will cross over the Aries Point and ingress the sign Aries again on the day of the Taurus New Moon, over which she has rulership. Venus being reborn from the realm of the collective unconscious symbolizes the resurrection and reintegration of the feminine principle in human affairs.